Better Butter - What makes grassfed, organic butter better? You are here: Home / Natural Health / Better Butter? What's on the plate? 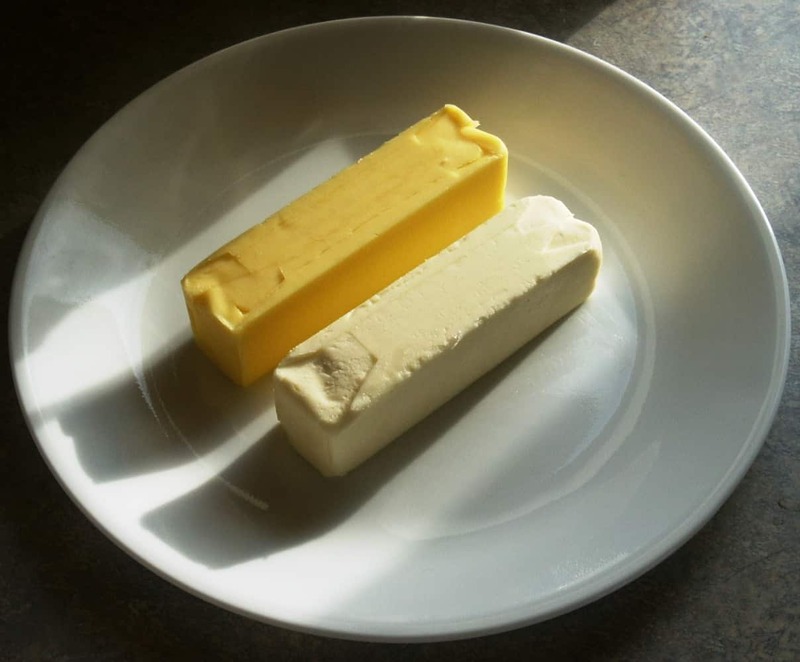 You may have guessed “butter and margarine”, but what you're looking at is Organic Valley butter on the left (top) and “store brand” butter on the right (bottom). I'd love be able to afford to use OV butter exclusively, but it's pricey, so we generally reserve it to use as a spread or other “table” use where you eat it directly rather than in a recipe. What's the difference between grassfed and standard butter? I still remember my first taste of Organic Valley butter, spread on a slice of home baked bread. Rich, smooth and BUTTERY – I know it sounds strange, but the organic butter simply tastes more like butter. Organic butter has other unique properties, too. I leave my “bread” butter out (unrefrigerated) so it stays soft and spreadable. I have a covered ceramic butter dish to keep the flies off, and we use it quickly enough that I have never had it go rancid. When it's really hot I only put out half a stick at a time. I have noticed that the organic butter is much firmer than regular butter, no matter what the temperature. In high summer the store brand butter will turn into a puddle if left out (we have AC, but I avoid using it unless it gets REALLY hot). The organic butter remains stable. It can't be a difference in density, as both blocks are the same size and the same weight. It has to be a difference in the fat content itself, and possibly the churning process. Here's a blurb from a Mother Earth News article on OV Pasture Butter. What I had in the photo was regular OV Cultured Butter, but you can tell from the color that these cows were definitely getting fresh grass. …grass-fed animal products are the richest natural source of CLA. CLA is just one of the omega fatty acids that have been found to be richer in grass-fed animals. The potentially important ratio of Omega-3 to Omega-6 fatty acids has also been in the news a lot, and Pasture Butter has a naturally occurring, heart-healthy optimal ratio. 2. AMAZING TEXTURE. It’s creamy, thick, dense, silky-smooth and super-duper-spreadable. Little-known fact: The spreadability of butter is determined by its ratio of saturated to unsaturated fat. If it’s relatively easy to spread, it has more unsaturated fat and less saturated fat. And a 2006 study found that the softer the butter, the more fresh pasture was in the cow’s diet. In fact, cows that eat nothing but grass have the softest butterfat of all. So until I get a cow in my backyard, I will keep enjoying organic butter. It stinks that real butter is a luxury. I pay 11.00 for a tub of cultured butter from grass fed cows (local farm). But hey. I'm single! lol This is a great blog. Glad I found it!! Hi Lisa – thanks for stopping by and leaving a kind comment. I'm with you on the butter. The craziest thing is that I am out in the country surrounded by dairy farms, some of whom still actually pasture their cows, and it's illegal for me to buy milk from my neighbors and make my own. As if my neighbors, who drink their own milk, are going to poison me. I raised on a dairy farm drinking raw milk and ti obviously didn't stunt my growth (I'm almost 5'9"). Katie, thanks for stopping by. As always, I am real food and real fat friendly. 😉 Looking forward to more of your postings about good fats. Thank you for sharing this on Whole Health Weekend link-up! Thanks Lea! Looking forward to linking with you for the Living Well blog hop. The OV butter looks like grandma’s butter 25 years ago. I remember store bought butter being that color. Now, it is not, but goodness LOL. I can not wait to go and get some soon! My grandmother was from Belgium. She worked on a farm where they made their own butter. They didn’t have modern refrigeration and their butter didn’t get soft. Of course, their animals were grass-fed. Grandmother used to say that the butter they made was made from sweet cream and was “worked” right. Our butter had too much water in it. She taught us a traditional cookie recipe. The first thing we did was to knead the butter to work the water out. That would make sense! I know if I don’t get my homemade butter dry enough, it doesn’t keep as well. Water would be cheaper to sell than butterfat.